Learn how to make a dhokla with mung bean sprouts, a popular snack from the state of Gujarat. Filled with protein goodness and familiar flavors, this vegan dish serves as a perfect snack or a brunch item. Want more ideas for snacks/appetizers? Browse few more here. Has it been more than a month since I wrote a post here? It was never my intention to take a break but sometimes life comes in a way one wouldn't really expect and before the realization dawns, time just slips away before it could be caught hold of. 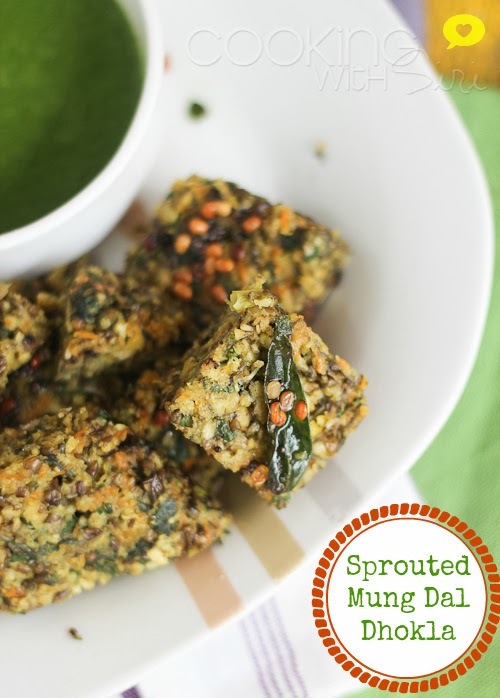 So, before its too late and I let the inertia to settle in, I literally dragged myself to publish this favorite recipe of mine - Mung Sprouts Dhokla, a version I tried and simply fell in love with. Making of the traditional version with just chickpea flour, also called as Khaman Dhokla is pretty common in many households. To give it a nutritious twist, I made today's recipe with handful of mung sprouts. Sprouting for me is very therapeutic in a way I can't explain in words. It is just an amazing feeling to see a fistful of dried beans convert into live sprouts. Try this super simple salad or this appetizer if you still have leftover sprouts to use up! 1. In a bowl, mix together - coarsely ground mung sprouts, grated carrot, spinach, ginger-green chilli paste, chickpea flour (besan), asafoetida, salt, eno/baking soda and turmeric. 2. Mix everything to make a coarse mixture. 3. In a flat plate, grease generously with oil. Place the mung dal mixture and spread evenly. Steam in a steamer or a pressure cooker (without the whistle) for 12 to 15 minutes or until the dhokla is cooked. 4. Heat oil and add all the ingredients listed under "Tempering" one-by-one. Saute for a few seconds and pour this tempering over cooked dhokla. Cut into pieces and serve with chutney. 1. Add the eno (fruit salt) or baking soda just before steaming. Don't let it sit for long once added. 2. Lightly cool the dhokla before cutting into pieces. Oiling the plate is necessary to avoid sticking it to the bottom. Sending this recipe to My Legume Love Affair # 69 hosted by Cindystar. The idea was initially conceptualized by Susan and currently being managed by Lisa. Also linking this recipe to Let's Cook with Seeds at Simply.Food. really nutritious recipe... can't wait to try! This is brilliant, Siri! I love the speckled look and how healthy it is. Lovely recipe and so healthy too, inviting you to link it to Lets cook with seed event at simply.food.